Whether you ordered larvae from a retailer or you handpicked specimens off your favorite shrub, witnessing the transformation from caterpillars to butterflies is rewarding and educational, albeit time-consuming. The requirements for caring for butterfly larvae are straightforward, although a few details can negatively impact your little friend. Caterpillars need three things to mature into healthy adults: the right food, a clean cage and a place to pupate. While they don't require daily interaction, affection or other requirements that some other pets do, they require you to clean their frass, or waste, and provide fresh cuttings from their preferred host plant daily. Other than that, these guys are programmed to eat until it's time for them to pupate. Caterpillars have one basic purpose in life: eating. It's one of the things that leads to certain species becoming major pests of some ornamental, vegetable and agricultural crops. Providing the right food is essential to caring for butterfly larvae. Without it, they'll perish. You have to find the correct type of plant. Female butterflies deposit their eggs on a host plant, a plant the larvae feed on. Some butterflies have several acceptable hosts; others may only have one. When you've discovered which type of larvae you have, finding a list of host plants is typically a breeze. Examples of host plants include milkweed for monarch larvae; cherry for cecropia moths and viceroys; papaw for zebra swallowtails; and parsley, dill and fennel for black swallowtails. 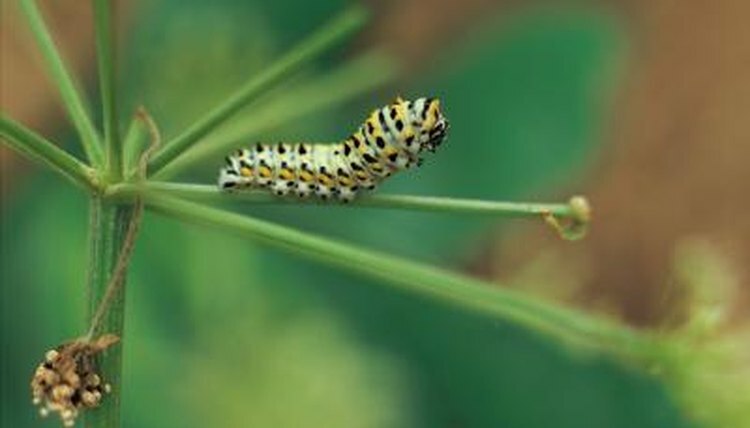 If you handpicked the caterpillar from a plant, chances are it was on a host plant and you can use leaves from this plant as food. Several types of containers will make a suitable home for a captive caterpillar. If you have a clean, empty aquarium at your disposal, you have an ideal home. If you don't, you can use a plastic container, a 5-gallon buckets or a plant pot. Butterfly-net material over the top of an open container will allow for ventilation and security. Place the host plant and caterpillar in the container and place the container away from direct sunlight to protect the caterpillar against heat. If you choose to keep a caterpillar in a single container throughout its larval and pupal stages into adulthood, the container must be wide enough and deep enough that the adults' wings will not touch the sides or the bottom when it emerges from its cocoon. A few signs can tell you when the caterpillar is going to form its chrysalis. Some species, particularly those that are in the same superfamily as the monarch butterfly, will hang upside down in a "J" shape before creating a chrysalis. Other species may turn a completely different color just before pupation; others, such as swallowtails, will expel undigested food just before finding a pupation location. Raising Butterflies: Larva to Pupa - Larva Hangs as a "J"